Wonder Bar show will benefit Asbury Park Music Foundation and the Boys and Girls Club of Monmouth. To close the 2 p.m. to 2 a.m. event celebrating the award-winning music column, Upstage legend Paul Whistler will lead an all-star jam with a variety of invited musicians who frequented the fabled coffeehouse where so many Asbury Park musicians cut their teeth. Confirmed to perform are original E Street Band drummer Vini Lopez, singer-songwriter-guitarist Joe Petillo, guitarist Billy Ryan, keyboardist John Mulrenan and more to be announced soon. Asbury Park Music Foundation will receive $1 from every ticket purchased. APMF will be present throughout the event selling the popular “Music Saved My Life” t-shirts, selling raffle tickets to win 2 Boardwalk VIP passes to the Asbury Park Music + Film Festival ($2,000 value) and giving away some cool prizes. 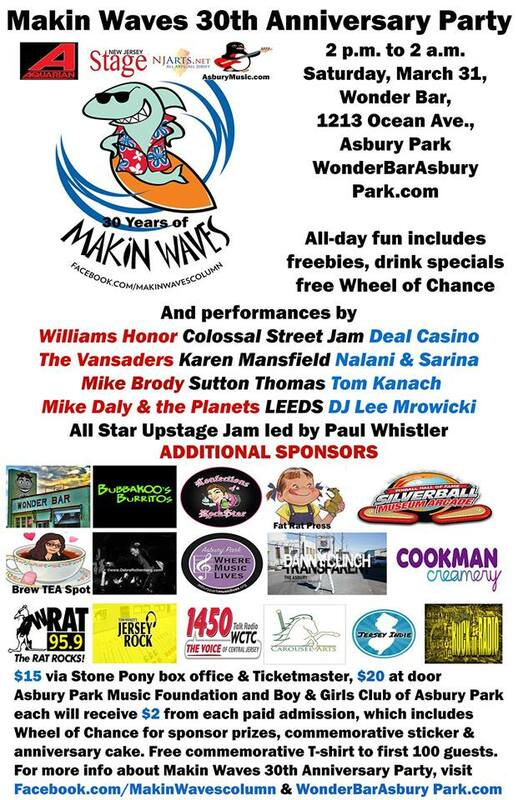 Tickets to the Makin Waves anniversary party are $15 in advance at the Stone Pony box office and via Ticketmaster (plus tax and surcharge) at https://goo.gl/hzsoaS, and $20 at the door.